It’s great to see the state of NSW getting behind women’s only grades at club level crit racing. For those who don’t already know a criterium, or crit, is a bike race held on a short course often held on closed streets. The course is short, usually less than 5 km, and is a closed circuit, where riders complete multiple laps. Riders typically race for a given length of time, then complete a specified number of laps. Last week I had a chat with Donna Meehan of Domestique who is the driving force behind the initiative. Donna is working with Cycling NSW and three Sydney clubs – Sydney Uni Velo (SUVelo), Lidcombe Auburn Cycle Club (LACC) and Southern Cross Cycle Club (SXCC). It all stems from a survey conducted earlier this year by Cycling NSW to gauge the level of interest in women’s only grades in races. There were a number of options proposed and the most popular was a monthly weekend race in the Sydney area with A and B grades. That’s exactly what they’ve delivered with this program listed below. Interestingly SUVelo had already started its own A grade women’s racing earlier in the year. SUVelo is a relatively new club establishing only two years ago. This is the first year of racing for the club so when they started crit racing at Heffron Park it seemed a great idea to have a women’s only grade. Melissa Neumaier who is the secretary of the club tells me it’s because of the feedback she and others had received from female cyclists who said that they rarely had the opportunity to win against the men because although they can keep up with the pack, they can never outsprint their male counterparts. So well done SUVelo for recognising that women could race against each other and being the pioneers in Sydney. As well the new women’s grades, Donna and Cycling NSW are proposing to host a number of skills days at the Dunc Gray Crit Circuit at Bass Hill. The morning session will include skills development, race tactics and preparation following by an afternoon of racing. The dates are listed in the table below. So come along and support this great initiative. I’ll definitely be there in my LACC kit at my home race on Saturday, 19 May. Sat, 19 May LACC SOP – Tennis Centre Sign on from 1pm. $15 entry. Provided you are a member of a club and have a silver licence (previously known as a recreational licence), you can purchase an upgrade at Sydney Uni Velo crit races on the day of the race. The cost is $33. 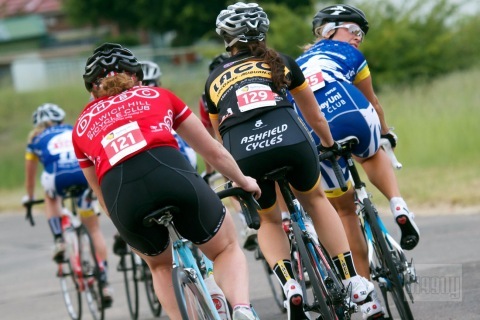 Starting with the 20 May race, we are starting 2 separate womens grades with the intention of introducing women who have never raced into doing just that in the womens B grade.